Margarita + beer = Tuatara ‘Sourgarita’ Summer Sour… but is it any good? Ingredients: water, malted barley, lemons, limes, hops, yeast. Blurb on the bottle: Globrally, we’re about as South of the Border as you can get. Combining the best of both worlds, we’ve wedded the famous Mexican margarita with a Kiwi hopped sour cerveza. Brewed with zesty limes, Sourgarita is a refreshingly citrus take on a sour style. Subtle malt characters sale the palate from a puckering finish. Cancun or the Coromandel, Summer will be muy, muy Bueno. Tuatara fact: Now a truly globe-trotting animal, the tuatara can even be found on the Mexiican border in the San Diego Zoo [this is actually written on the side of the bottle]. Tuatara’s Sourgarita is a summer sour, and yet I’m drinking it in winter; I guess that means this beer isn’t as fresh as it could be. However, it still seems like a lively, well-carbonated, fizzy beer. There’s no real head to speak of. The beer is light lemon yellow in colour, and the aroma is lemon and lime. It’s certainly a thirst-quenching beer, ideal for sunny days and warmer months, with an acidic, citric kick. 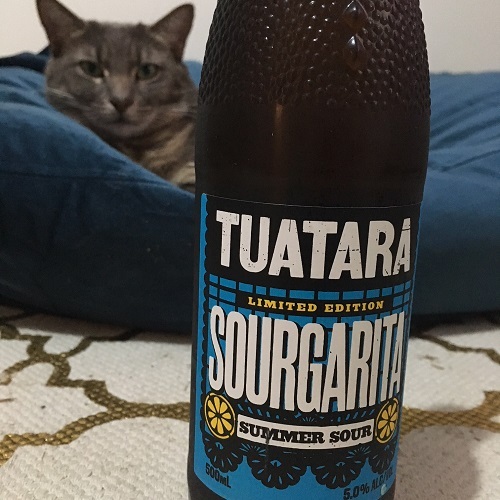 The verdict: If you like sours, then Tuatara Sourgarita Summer Sour is well worth a look. And if you actually like popular Mexican beers like Corona Extra or Pacifico, then your expectations are obviously very low, so you should love this beer! Beer/movie combination: I won’t pass up this opportunity to recommend a good old-fashioned western to go with this Mexican-inspired cerveza. A Fistful of Dollars (1964) is the first of Clint Eastwood and director Sergio Leone’s “The Man with No Name” trilogy, so you should definitely re-watch that (or check it out for the first time if you’ve lived a very sheltered life). It’s great!